Archdale First Church began in 1922 when a letter was written to The Gospel Trumpet requesting that a minister come to begin a work in the High Point area. There was no mention of a salary or monies to pay for train fare for the “get acquainted” visit, yet a young man, Roy Kendall from Lamor, South Carolina responded to the challenge and became the first pastor. In those early days, the church traveled from home to home for cottage meetings, and later rented buildings in which worship services were held. In 1925, the congregation of thirty purchased land and a 30×40 one-room building was erected. The land and building cost $1,150, and by 1928 the debt had been paid down to $850. As the church grew, more land was purchased and a new building was constructed on South Main Street in High Point. The building and parsonage were completed in the early 1950’s while Arlo Newell served as pastor. Years later, land was purchased in Randolph County, with the hopes of one day building a larger facility on that site. 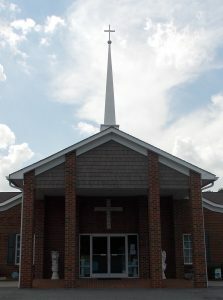 On the first Sunday of August 1999, the congregation moved once more to the new building on Weant Road in Archdale. Pastor Hallie Scott worked with the Board and the church and in August 2001, the Day School opened, serving the children of the community. The church continues in its legacy as plans are underway for an additional building. The future building will serve as a Family Life Center and sanctuary. This new addition will allow the continued growth of the Day School, as well as add new programs and to enhance the church’s ministry within the community. As the next era of ministry opens, it is the prayer of those who call Archdale First Church home, that God and all who come later would find us faithful!